This month, the National Glaucoma Awareness Month by Prevent Blindness, the nation’s oldest volunteer eye health and safety nonprofit organization, and other leading eye health groups, across the country are putting the spotlight on Glaucoma, referred to as “the thief of night,” one of the leading causes of irreversible blindness. At first, glaucoma has no symptoms and it causes no pain. Your vision stays normal. Glaucoma can develop in one or both eyes. Without medical treatment, people with glaucoma will slowly lose their peripheral (side) vision. As the eye disease remains untreated, people may miss objects to the side and out of the corner of their eye. They seem to be looking through a tunnel. Over time, straight-ahead (central) vision may decrease until your eye sight is permanently lost. Health care professionals say that you can protect yourself against Glaucoma by having annual dilated eye exams yearly. This eye disease can be treated with prescription eye drops, lasers, or surgery. Currently, more than 3 million are afflicted with this sight-stealing disease. The Bethesda, Maryland-based National Eye Institute, part of the federal government’s National Institutes of Health, projects this number will reach 4.2 million by 2030, a 58 percent increase. Those numbers are projected to increase steadily as more baby boomers move into retirement years. January’s National Glaucoma Awareness Month is hope to raise the awareness of this impending epidemic of blindness. Age, race, family and medical history, are all factors that increase the chances of developing glaucoma. In fact, individuals aged 60 and older are at higher risk. For African-Americans, this risk begins even earlier – those age 40 and over are up to five times more likely to have glaucoma. 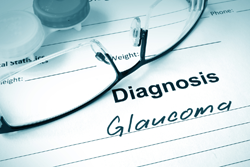 Hispanics are also at increased risk for glaucoma as they age. Those of Asian and Native American descent are at increased risk for angle-closure glaucoma, caused by a rapid or sudden increase in pressure inside the eye, called intraocular pressure. “Unfortunately, there is currently no cure for glaucoma,” said Jeff Todd, president and CEO of Prevent Blindness, in a statement announcing the kick-off educational activities throughout the month. “However, promising new treatment research is underway. Through early detection, access to care, and by diligently following your eye doctor’s treatment plan, progressive vision loss can be significantly lessened,” he says. According to the San Francisco-based American Academy of Ophthalmology, the eye constantly makes aqueous humor, the clear liquid inside the front part of the eye that nourishes it and keeps it inflated. As new aqueous flows into the eye, the same amount should drain out. If the drainage angle is not working properly, fluid builds up. Pressure inside the eye rises, damaging the optic nerve, which sends information from the eyes to the brain. When glaucoma damages the optic nerve, patches of vision, usually peripheral vision, are lost permanently. The AAO’s EyeCare America program provides eye care at no out-of-pocket cost to medically underserved seniors age 65 and older, and glaucoma exams to those at increased risk. For more information, visit http://www.aao.org/eyecare-america. For more information on glaucoma, or other financial assistance programs, including Medicare coverage, please call Prevent Blindness at (800) 331-2020 or go to http://www.preventblindness.org/glaucoma. Our February Calendar and Newsletter are Here! Interested in a personal tour? Interested in a personal tour? We're here for you. © 2019 West View Nursing and Rehabilitation Center. All Rights Reserved.